"Common Yoga Protocol" is prepared by Ministry of Ayurveda, Yoga & Naturopathy, Unani, Siddha and Homoeopathy (AYUSH). This book contains.. Introduction,What is Yoga?,Brief history and development of Yoga,The Fundamentals of Yoga,Traditional Schools of Yoga,Yogic practices for health and wellness,General Guidelines for Yoga Practice,Food for thought,How Yoga can help ? and 1. Prayer,2. Sadilaja /Calana Kriyas/Loosening Practices,3. Yogasanas,4. Kapalabhati, 5. Pranayama,6. Dhyana,7. Sankalpa,8. 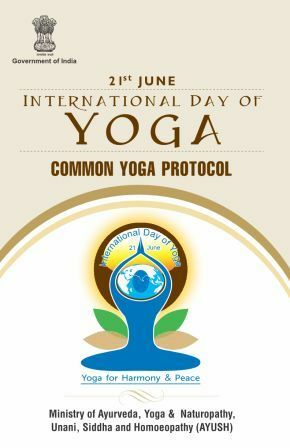 Santih Patha,Textual References ,Yoga Geet, Glimpses of International Day of Yoga Celebrations and many more..